Modern Classic Jewelry - This stunning and dramatic wide handcrafted statement slip-on bracelet is hand-formed from 18 gauge sterling silver with a narrow reverse beveled rim on the edges. 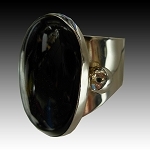 This dramatic cuff features a large oval Black Onyx cabochon. This is a classic handcrafted sterling silver bracelet that is wide and certainly makes a statement, but is easy to wear. 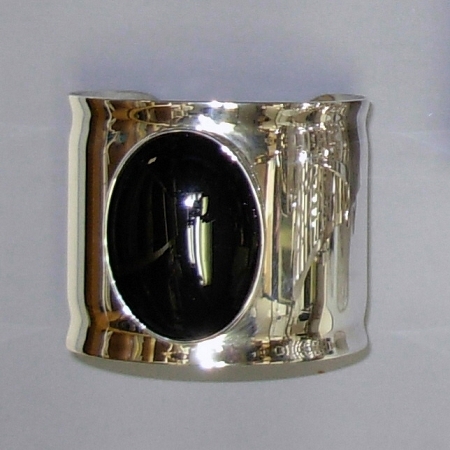 The cuff features an oval Black Onyx cabochon that is fully encased in sterling silver. The cuff bracelet is high polished and is constructed from 18 gauge sterling silver. The bracelet approximately is 4" wide. 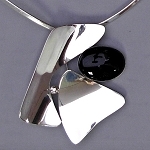 The black onyx is approximately " long x " wide (40mm x 30mm).